Back at the tail end of 2009, I discovered the brilliant Book Chick City, around the time of sign-ups for the Thriller & Suspense Challenge 2010 were happening. Was I tempted? Of course – 12 Thriller or Suspense books in 12 months. What a plan. Plan didn’t go exactly to plan though, and at the end of December 2010 I was frantically reading Her Fearful Symmetry by Audrey Niffeneger in the hope that I could finish it by the end of the year, and that it would count as a thriller/suspense. Someone else had added it as their book, so I figured I was good on that, then on 30th (I think) I finished it. Phew. Even before I finished it, I knew I had to do it again, so after the slight name change to the Mystery & Suspense Challenge, I signed up again – promising myself to do better in 2011. I thought I was doing ok when we had about 2 months left, even though November was NaNo, so my reading time was limited. I was wrong I had 4 books left to read. Eek. Somehow I powered through the writing madness and continued to read. Then mid December I did a count up, and I’d actually read 13 books. Um, oops. How did that happen? Me thinks someone’s maths isn’t that great (counting to 12 – apparently it’s harder than it sounds!). Just to prove how bad my calculations are – I’ve just recounted, and only have 12. Hmm. Something odd is going on here! Yay, I completed the challenge again. The only problem is that until today, I hadn’t posted my reviews for them all. Heck, I read them, that’s what counts. February – Fear No Evil by Allison Brennan – Again, fab. Again can’t wait to read the other 2 books in the series. February – Fear the Worst by Linwood Barclay – I think Barclay is my favourite thriller author at the moment – says it all. April – Past Mortem by Ben Elton – not as good as some of his other books, but still really good. June – The Truth About Melody Browne by Lisa Jewell – Love Jewell so much. This took me a while to get into, but once I was there I was hooked. June – The Ice Cream Girls by Dorothy Koomson – Love Koomson and everything she writes – this included. August – Every Last One by Anna Quindlen – Took me a while to get into this, and the whole pace was a bit too slow for me. October – Mitigating Circumstances by Nancy Taylor Rosenburg – Was hooked from the off – brilliant. October – The Sculptress by Minette Walters – Love, love, love. November – The Birthday Present by Barbra Vine (Ruth Rendell writing as) – slow, and bored me a little. 12 books, 12 months. I loved the challenge so much, that, yep, you guessed it, I’m doing it again in 2012 – yay! Like the past 2 years, you don’t have to chose the books you are going to read for the challenge ahead of time, but I know for sure that I want to read the next one from each of the series’ by Jeff Abbott and Allison Brennan that I read in 2011. Other than that, I just don’t know, but can’t wait to find out. Read more about the challenge here and if you’re interested sign up – it’s great – you won’t regret it! I finished Fear No Evil by Allison Brennan yesterday. I loved it. During the first half, I spent most of the time questioning why I was enjoying it and reading it, when the topic was so nasty and was pretty gory. But the way it’s written just draws you in, and I loved the characters. This book is the final in a trilogy – I’ve not read the first two, but I really want to go back and read them (when I’m not doing an A to Z challenge). The MCs in the first and second are siblings of one of the MCs in Fear No Evil so I kind of know them, althoug I’m not as keen to read them as I would be if it was the same MC (Dillon the MC in this one is awesome – you know if it was a film you’d totally fancy him). 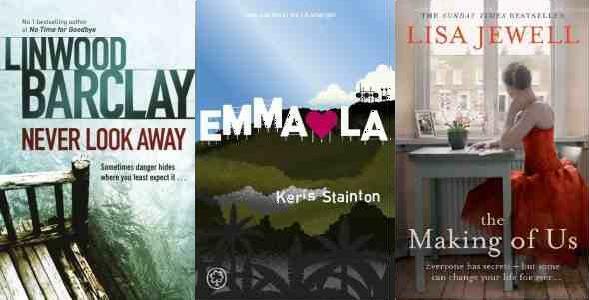 I’ve just realised I’m totally behind with my reviews for books for both the A to Z challenge and the Mystery & Suspense challenge. Hmmm. Will have to rectify that sometime. Maybe I’ll wait until I have the week off and catch up then. So far I’ve read 2 for the Mystery & Suspense and A and B for the alphabet one. Or more technically A and A and B. I’m just about to start another B… oops… But… it’s also another for the M&S challenge, so all good. I guess. Kind of. That paragraph I wrote about Fear No Evil was almost a book review. Hmmmm. Might have to use that! The next book I’m going to read is Linwood Barclay’s Fear the Worst. I bought it last weekend, but don’t have a clue what it’s about. I bought it totally on the author’s reputation. I’ve read two of his books and loved them, so when I saw another I had to have it. Imagine… being an author whose books people buy on the knowledge of your writing. Cecelia Ahern, whose book The Book of Tomorrow I read earlier in the month, is the same – I picked that up because I knew I had to read more of her writing if it was available. It didn’t matter what it was about. Marian Keyes, Jane Green, Lisa Jewell and Dan Brown are some of those people. There are more, I know there are more, but I can’t think of them now. Starting to Move and BOOKS! So my big news (totally un writing related) is that I’ve found a flat. I should really say ‘we.’ My boyfriend and I are getting our own place… in 3 weeks. Yay! It’s this cute little flat in an area called Canada Water really really close to the Thames, and almost with a wicked view of Canary Wharf. Nearly. Just 2 weeks of work, a week off, a weekend move then we’re in – awesome. We have to move out of where we are now about 5 days before we can move into the new flat, so we’ve decided to take the whole week off work, and go back to the midlands to see the parents (they live pretty close, so we can do all of them in the same visit – nice). I’ve already started thinking about the writing I can get done that week. Yes, you read that – WRITING. I’m fully going to get back into it soon. I’ve got a lot of packing and sorting to do in the next couple of weeks (two weeks yesterday we move out, and yes, I did move about 6 weeks ago, but we’ve got to put our stuff in storage for a week, so I need to pack better! ), but I’m going to try to do some. I’ll then have a week of holiday, where I’ll get at least a little done each day – in fact I’ll set myself a challenge of 250 words a day, EVERY day during that week. We move that weekend, and then settle in, so I’ll get my new routine for writing. I can’t wait. 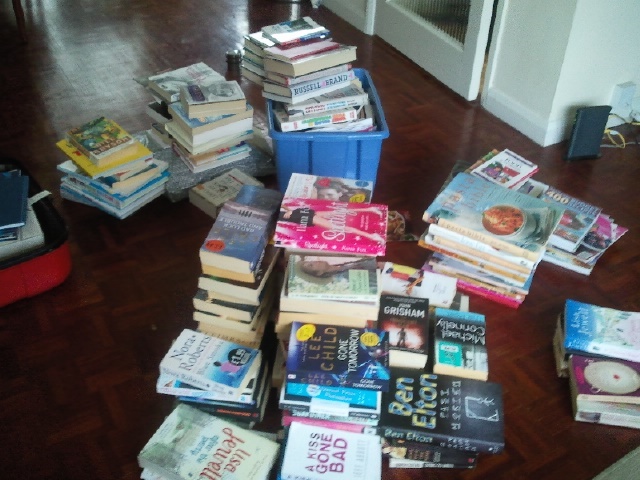 The fiction books are in the huge pile at the front. I’ve read about 6 of them. All the rest are on my TBR pile (which is obviously why I went out and bought a couple more yesterday!). The ones at the back in the blue box and to the left are the non fiction, and the smaller pile on the right are my cookery books. The tiny pile in the bottom right are the five I’m chucking out. Five. Oh dear! I our new place we’re going to get a wall to ceiling, length of the room bookcase/shelving unit. I cannot wait to get it and get these all out on show. EXCITING! I did some writing this morning. I was lying in bed awake because someone had set the alarm, even though we had a day off and I couldn’t get back to sleep. I started thinking about the book I’m reading (Fear No Evil by Allison Brennan) and thinking about how well she does graphic violence scenes. Well enough that every time I get asked how my book is, I say it’s horrible. So, really well. That led me to think I couldn’t do it that well. But then, how do I know? I’ve never tried. So I tried. Typically for me, it turned into a character analysis. Janey was watching her friend get tortured by having her finger chain sawed off (nice eh), but there was only a little about the blood, then it went to why Janey couldn’t run in and help, and how she was feeling. Hmmm. I don’t want to, but I think I should practice this type of writing. You never know where it will come in handy. One final thing about valentine’s day – although more about books. The man in my life doesn’t go in with the whole valentines day thing. I used to get upset about it, but as he buys me things all the time, takes me out for dinner etc I don’t mind so much any more. He cooked me dinner last night, which was really nice (especially since we’d put an offer in on a flat that day too – I totally took that as my present! ), but then at like 22.00 he decided we were going shopping cause he wanted to buy me a book – or two. WOOP! I love 24 hour supermarkets! At first I couldn’t find anything I wanted. Then I found loads. I settled on two though. Fear the Worst by Linwood Barclay and another book that I totally can’t remember. And is now in the bottom, or maybe middle or top, of a sealed box ready to move. Damn. It’s there because I know I can’t read it for a while cause the author’s surname begins with H or M or something, and in my A to Z challenge I’m on B. And want to read another B and maybe two Cs. It’s going to be a while!